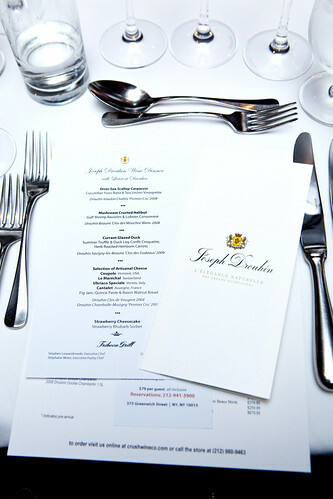 Last night I was invited to a Rue La La dinner partnered with Tribeca Grill featuring Joseph Drouhin wines from Burgundy, France. 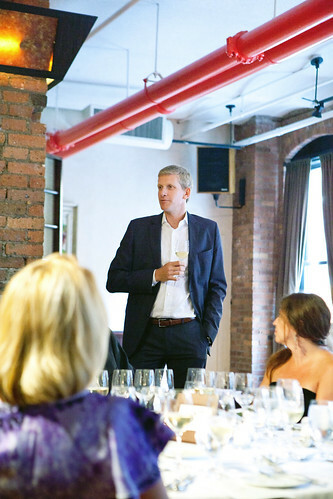 Laurent Drouhin, the great grandson of Joseph Drouhin joined the festivities for educating us his family’s wine and wine in general. 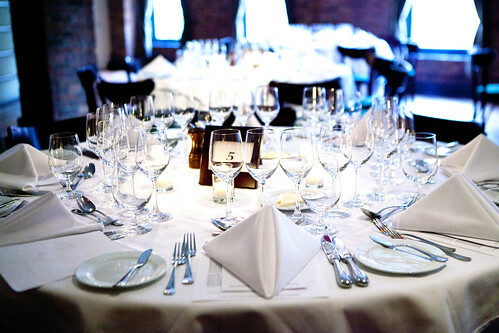 This five-course dinner paired with wines seemed pretty epic. 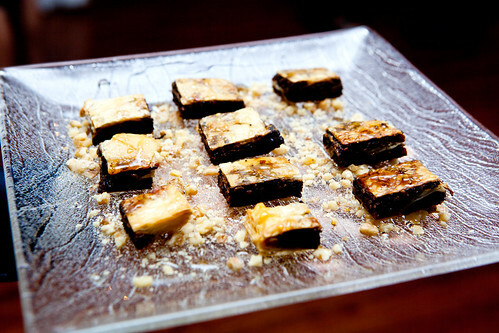 As for the food aspect of the reception hour, hors d’oeuvres were passed around. 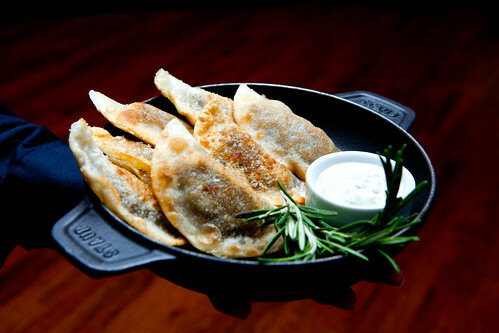 Plates of short rib pot stickers, well-salted and meaty with a nicely thin, golden seared crust. 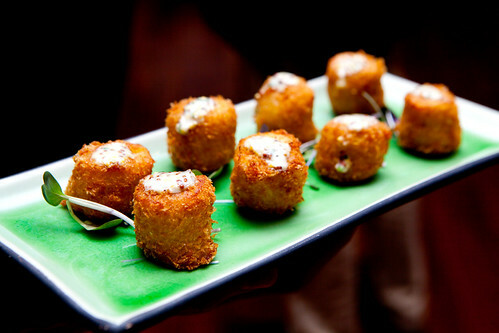 The crispy, wispy crusted cod fritters topped with whole grain mustard. 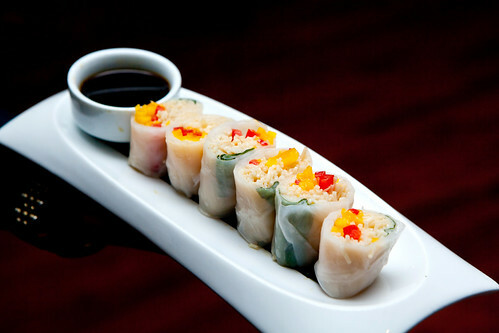 A refreshing summer spring rolls filled with basil, mint, mango and red bell peppers, and enoki mushrooms, and a deliciously intriguing mushroom baklava that mixes sweet with savory, as it was glazed with truffled honey. 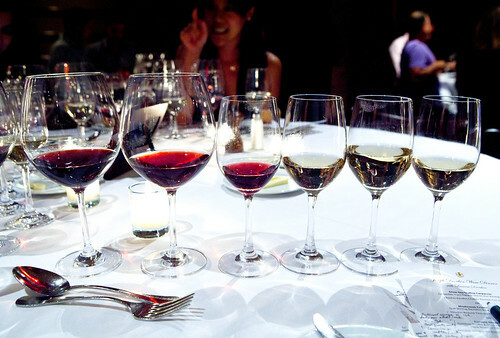 All of these bites were great with the Drouhin Saint-Veran. After some brief introduction to the restaurant by Tribeca Grill’s wine director, David Gordon and Laurent Drouhin speaking about the first course’s wine, we had the diver sea scallop carpaccio. This capaccio was well executed. 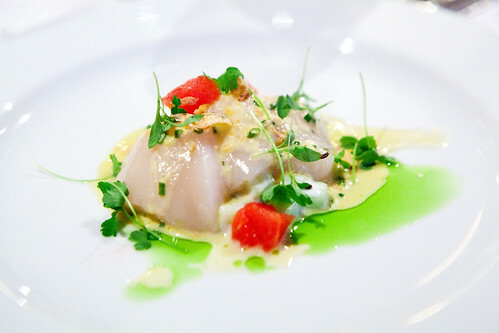 Pristine, silky scallop was made a bit creamier from the sea urchin vinaigrette and the cucumber raita added some freshness. 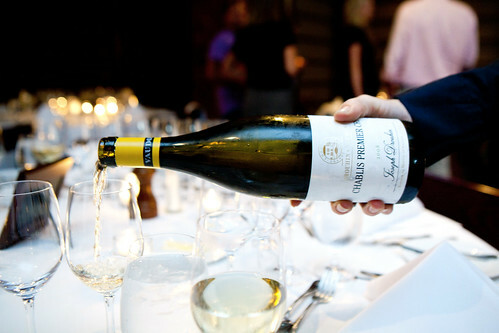 Paired with the Drouhin Vaudon Chablis ‘Premier Cru’ 2008 was dry and fruity with hints of citrus. Lovely together. 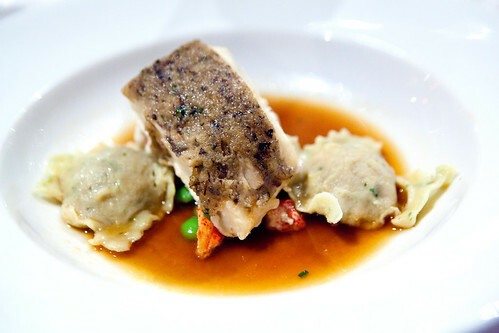 Moving onto the mushroom crusted halibut made with sweet Gulf shrimp raviolini sitting in a shallow pool of intensely flavored lobster consomme dotted with a few shiitake mushrooms, sweet peas, and lobster meat. This dish was paired with the Drouhin Beaune ‘Clos des Mouches’ Blanc 2008. What was cute about this wine, relatively speaking, was the fact that “mouches” means flies and it’s referring to the honey bees that used to reside at the southern end of the Beaune appellation, next to Pommard. It tasted fruity, floral and a bit of earthy nuttiness. 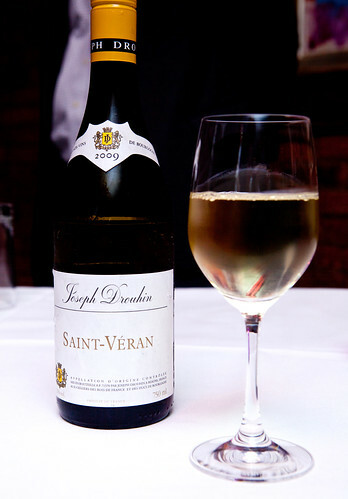 Very delicious wine alone and it ties well with the mushroom’s earthiness on the fish and in the stock. The currant glazed duck breast with summer truffle and duck leg confit croquette, herb roasted heirloom carrots was perfectly cooked to a medium-rare and the currant glaze made it a touch sweet-tart. 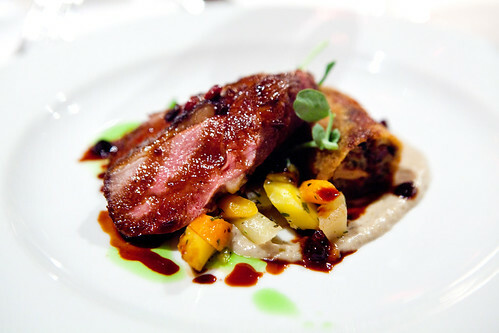 Paired with Drouhin Savigny-les-Beaune ‘Clos des Godeaux’ 2009, the wine’s lush red fruit flavors went along with the currant sauce and its subtle tannins work with the duck without dominating it. 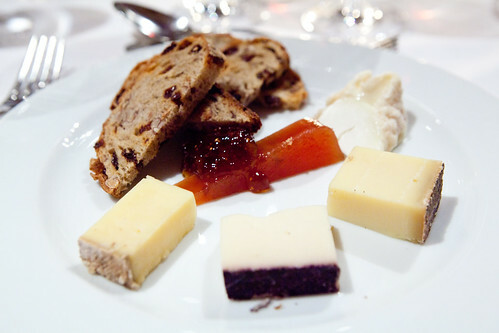 For the fourth course, the cheese plate, we’re served with two glasses of wine: Drouhin Clos de Vougeot 2004 and the Drouhin Chambolle-Mysigny ‘Premiere Cru’ 2003. Of the two, I liked the Chambolle-Mysigny more. It’s silkier, lusher red berry flavors, and not as tannic. As for the cheese plate itself, there were slices of creamy goat’s milk Coupole from Vermont, a firm cow’s milk Le Maréchal cheese from Switzerland (kind of reminds me of Gruyere but a touch mustier), a firm, crumbly Ubriaco Speciale from Veneto, Italy that has the flavor of wine, and the semi-hard Cantalet from Auvergne, France that is similar to cheddar but has a sweeter, buttery flavor. 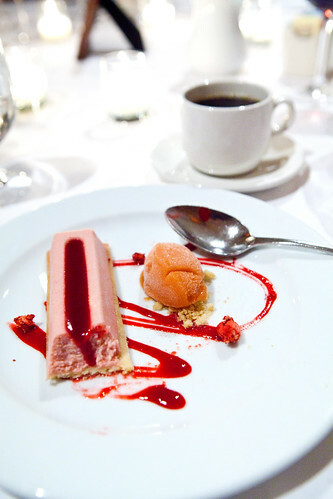 The highly anticipated pièce de résistance for my table, was the strawberry cheesecake. This isn’t made the typical way that you’d be presented with a graham cracker crust, baked on top the cream cheese based custard. No, this was done the new school way, relatively speaking. 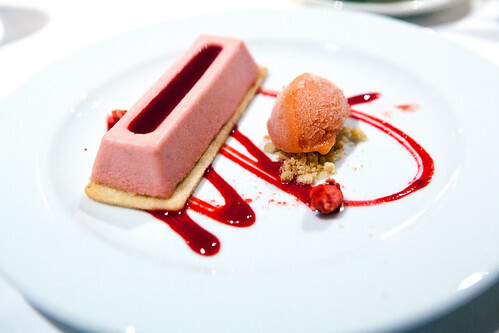 The crust was über thin and buttery melding well with the strawberry cream cheese custard, filled with strawberry coulis. The strawberry rhubarb sorbet was spot on being sweet and tart. Overall, this dessert was light yet satiated my sweet tooth. Above was my rainbow collection of wines of the evening. Every one of them were tasty and I would drink it all. But I have to keep a limit before I would need to borrow a cot and sleep overnight at the restaurant. It was a successful event, in my opinion. Everything was organized well. 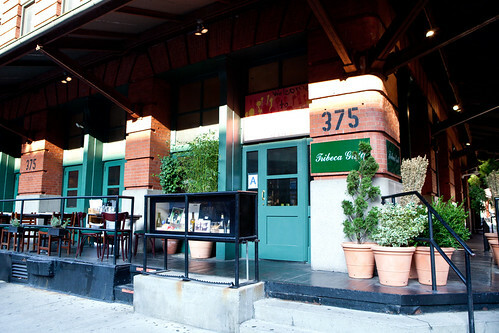 Service was professional and friendly. Mr. Laurent Drouhin was informative, funny and not pretentious. The food and wine were fantastic. 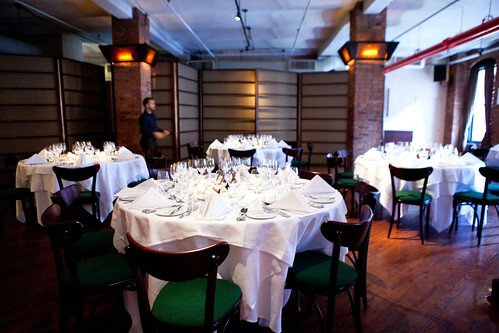 Even my tablemates, who I met for the first time, were entertaining and opinionated (in a good way). Fun times, even though it was (sadly) a Monday night.